You need to be careful while overloading a method in Java, especially after the introduction of autoboxing in Java 5. Poorly overloaded method not only adds confusion among developers who use that but also they are error prone and leaves your program on compiler's mercy to select proper method. One of the best examples of a poorly overloaded method is the remove method of ArrayList. There are two versions of remove, first, one which takes an Object as argument i.e. remove(Object element) and the second one, which takes an index as argument i.e. remove(int index). It worked fine until Java 1.4 where there is clearly a distinction between primitive types and objects type but in Java 1.5, where you can pass an int primitive to a method which accepts an Integer object, creates some nasty problem. Now suppose you have an ArrayList of Integer with values 1, 2 and 3, and you call remove(1) then which method will be called? JVM can interpret 1 as index also or 1 as Integer object also. It's best to avoid issues related to method overloading by following some Java best practices. 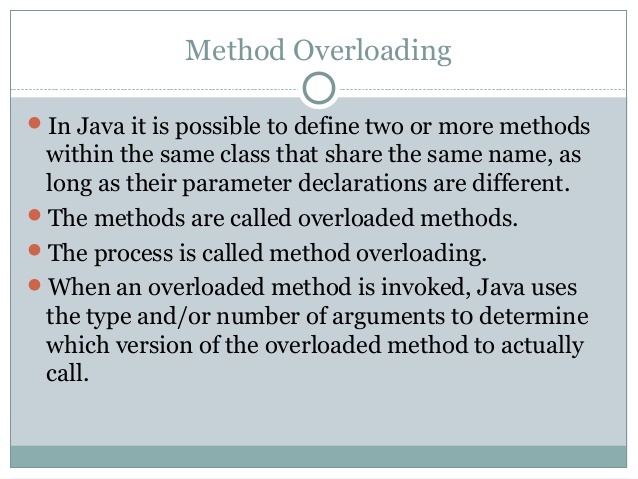 For those who doesn’t know what is method overloading in Java? method overloading means declaring more than one method with the same name but different method signatures. This is generally done to create methods which do same thing but with different types. 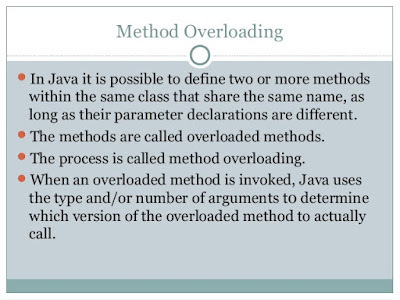 For example, one of the most popular examples of method overloading is System.out.println() method, which is overloaded to accept different types of parameters like String, double, int etc, see this Java tutorial on method overloading and static vs dynamic binding for more details. By the way, all of these Java best practices which are explained in the context of method overloading are equally applicable to constructor overloading in Java because in terms of overloading method and constructors are almost same. Here are some of the common things which you can remember while overloading method or constructor in Java. These Java best practices are completely based upon experience and you may have some more to add to this list. let’s see my list of Java best practices while overloading method in Java. To the surprise of some programmers method with argument type List is called both the time, instead of expected method which takes ArrayList and LinkedList, because method overloading is resolved at compile time using static binding in Java. This is also one of the reasons, why it's important to clearly understand difference between method overloading and overriding in Java. Here expected case is result of mistaking overloading as overriding, which work on the actual object and happens at runtime. To know more about static and dynamic binding in Java , you can also see my post difference between static and dynamic binding in Java. Many Java programmer expects that Integer(1) object would be removed but since remove() is overloaded, compiler choose remove(int) over remove(Object). Rules of which overloaded method gets chosen in case of autoboxing is complex and hard to remember, so Its best to avoid two overloaded methods where one accept Object and other accept primitive type. If by any chance you must have to do this then make sure both of them perform the identical function. I like this kind of advice which is based on experience. Though You don't call all these as Java best practices, rather common mistakes to avoid while doing method overloading and constructor overloading in Java. All most all API including JDK does that. Look at Arrays.toString() method it has overloaded for all above types. thanks dude, for giving such a great information. but i want to know, why method overloading called compile time polymorphism? Thank you Arun, I am glad that you find these best practices about method overloading and constructor useful.